This is the journal entry from my quiet time with God one day this past week. Israel and the high priest, Eli’s two sons, Hophni and Phinehas, had largely forgotten God. They relied on their own ideas and impulses. After going into battle against the Philistines and losing, the Israelites hit on a plan: They would bring the ark in which God’s presence on earth dwelt onto the battlefield. The Philistines understood that Israel’s God had been faithful to the Israelites, delivering them from slavery in Egypt, giving them victories as they took the places assigned to them in the promised land. So, they were afraid and resolved to fight hard when they saw the Israelites had dragged “their god” onto the field of battle. The Philistines crushed the Israelites and took the ark of the covenant besides. (2) They treated the ark of the covenant not as the place where God dwelt on earth, but as a good luck charm. If God isn’t in the things that we do as His people, we will fail no matter how many times we invoke God’s name. When I was in school and we neared the end of an academic year or of a quarter, we reviewed all that we’d learned before we took the final test or heard the final bell. Today is the last Sunday of the Easter Season, 2018. 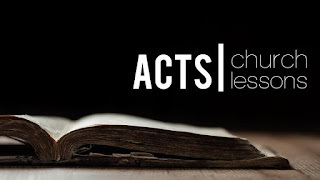 Throughout this season, we’ve looked at the New Testament book of Acts. Acts is the history of the early Church, from Jesus’ ascension somewhere between 28 and 33 AD until sometime around 90 AD. We’ve considered how the early Church followed Jesus, lived life, and shared Jesus with others after Jesus had gone back to heaven. Today, we will review the lessons God has been teaching us throughout Acts. But there’s a sense in which all of the lessons we’ve derived from Acts this Easter Season are summed up in the sixth one we cull from today’s appointed first Bible lesson, Acts 1:12-26. It's this: Every decision we make as the Church and as individual disciples is to be rooted in God’s Word and in prayer. In other words, our every action, our every word, are to be rooted in a relationship of intimacy with God that we share together as sisters and brothers in Christ. If we do anything in life apart from the life-giving power that only comes to human beings through Jesus Christ, apart from an intimate relationship with the risen and ascended Jesus, we will never accomplish all that we might otherwise. Proverbs 16:25 tells us, “There is a way that appears to be right, but in the end it leads to death.” We need to be connected with the God we know in Jesus in order to make the right decisions in life. As the Church and as individual disciples of Jesus, our standard isn’t what the world thinks. It isn’t what the standards of this or that profession proscribe. The only One Whose say-so matters is Jesus. That’s why the apostle Paul said, “I can do all this through him [Christ] who gives me strength” (Philippians 4:13). A friend recently asked me about a decision I’d made and why I felt so confident about it. Above all, I wanted the person to know that I have no confidence in Mark Daniels. Zero. There were two very different reasons for my confidence, I explained. First, because I had spent time every day with God in His Word and in prayer. Second, because the decision I sensed that God was calling me to make was precisely the opposite of what I had wanted to make before I started praying. I’d preferred the easier route; God pointed me to the harder one. What, my friend wondered, had God done to make things clear to me. I told him that it was the same way God has always made things clear to me from the day I came to faith in Jesus. No voice from heaven. No flashing lights. No bolt from heaven. Just peace, clarity, and certainty. I liken it to the experience of Elijah who sought a word from God. God didn’t make Himself known to Elijah in a mighty wind that cracked open ancient rock formations. God didn’t reveal Himself or His Word to Elijah in an earthquake. God didn’t disclose Himself or His will to Elijah in a raging fire. Elijah only finally perceived God in “a gentle whisper,” or as another translation puts it, “a still small voice” (1 Kings 19:12). Elijah experienced “the peace of God, which transcends all understanding” (Philippians 4:7). And that’s what you and I can experience when we seek intimacy with God, when we root everything we do and say in the Word of God and in prayer in Jesus’ name. We find the early Church acting on that belief in today’s first lesson, Acts 1:12-26. Let’s set the stage: The eleven remaining apostles have just returned from the Mount of Olives from which they had watched the resurrected Jesus ascend back to heaven. Just before that, Jesus told them to wait for the Holy Spirit’s power before they pursued the mission of the Church, making disciples. The apostles are to wait. And how do they wait? The apostles and the others with them spent their time waiting by praying. We don’t know the content of their prayers in Jesus’ name. But we do know that they prayed. They waited on God. After a period of prayer, Acts tells us, starting at verse 15, Peter felt compelled to speak. As he’d been praying, Peter had also been considering the Word of God. Listen: Prayer that isn’t rooted in God’s Word can deteriorate into a self-absorption that leads us away from God. Considering God’s Word as we pray can remind us that our primary concerns, in order, need to be: God first, others second, ourselves last. But considering God’s Word without prayer can turn Bible-reading into an intellectual exercise, the acquisition of facts untethered from God. You get bragging rights at the next small group or Bible study meeting. Peter knew that prayer and consideration of God's Word need to go together. So, as he prayed, he remembered or read two passages from the Psalms, Psalm 69:25 and Psalm 109:8. As he prayed, Peter understood the application of these two verses to the life of the Church. Always, as we read Scripture, we need to be asking God, "How does this apply to me today? What does this passage tell me I need to see or do today?" Peter, in prayer, considering God's Word, and considering the life of the infant Church, saw an application in those two passages from the Psalms. Let me explain: Jesus was the fulfillment of the mission of salvation and new life God had started Israel, with its twelve patriarchs, the great-grandsons of Abraham and Sarah. Israel’s entire purpose for being was to bring God’s salvation to the world through the birth of the Messiah, the Christ, God's Anointed King. When Jesus called apostles, He called twelve of them. That was no accident! Through the apostles' proclamation of new and everlasting life for all who turn from sin and trust in Jesus, a greater Israel, one made up of Jews and Gentiles who believe in Jesus, was to come into being. Judas had been called to be an apostle. But he had betrayed Jesus and defected to Satan, the Evil One. The psalms told Peter that someone who, like the other apostles, had witnessed Jesus’ resurrection had to take Judas’ place as an apostle, a patriarch of God’s enlarged Israel so that the mission of the Church could proceed as God intended. Instead, the group came up with the names of two men who had been with Jesus from the day that Jesus was baptized in the Jordan until they saw Him risen from the grave, then asked God to show which of the two--Justus called Barsabbas or Matthias--it should be. They cast lots to figure out who God chose. We don’t know exactly what the Bible meant when it spoke of “casting lots”: It could have been tossing dice, drawing straws, or something else. But the point is, when God’s people “cast lots,” they weren’t putting their faith in dice or straws. They were trusting God to show them what to do after they had prayed and considered God’s Word. The lot fell to Matthias and, at that moment, having a full complement of twelve apostles, the Church was ready for the coming the Holy Spirit. However tempted any of them may have felt, all accepted that, because they were people rooted in prayer and God’s Word, Matthias was the apostle God had chosen. (1) In all ways, we are to seek to take care of the needs of our fellow believers so that together, we can be authentic witnesses for the new life God is establishing in all who confess that Jesus Christ is Lord. (2) Share Jesus, knowing what to share about Jesus, sharing what we have personally experienced of Jesus, and looking for opportunities to share Jesus. (3) The only power to overcome the sin, death, and futility of this world is the risen Jesus Christ. The true, eternal Church is made up of those who trustingly live as though they believe that’s true...because it is! (4) Every disciple in Christ’s Church is a witness for Christ. (5) God has no favorites. (6) Every decision we make as the Church and as individual disciples is to be rooted in God’s Word and in prayer. And honestly, as I've said, if we can remember this last one, God will empower us to do the rest. We who make up Christ’s Church need each other. The New Testament describes the Church as Christ’s body. When any part of its body gives up on mutual care, sharing Jesus with others, trusting in Christ’s power over sin and death, being witnesses, accepting that God loves and Jesus died and rose for all people, or regularly praying and considering God’s Word, the body can’t function as Jesus intends for it to function. empower us to live the life that our Church Lessons show us are meant to be normal for everyone who confesses Jesus as Lord. Look, I know how busy life can be. I’m right there with you. But I also find that the more time I spend in God’s Word and in prayer, the more time God seems to manufacture for me to get the things I need to get done accomplished. And I am assured through this regular interaction with the God I meet in Jesus that maybe the things I think I need to get done don’t need doing at all. In the end, the Christian life is simple: To stay close to Jesus and to share Jesus with others. Spending intimate time with the God we know in Jesus will help us to live that life. Martin Luther, whose life was filled with busy-ness, including preaching, teaching, pastoring, leading, raising a family, and welcoming all sorts of people to his home, once said, “I have so much to do that I shall spend the first three hours [of every day] in prayer.” Never try to face the frenzy of daily living before spending time with the One Who can conquer any storm! “Come to me, all you who are weary and burdened,” Jesus tells us, “and I will give you rest” (Matthew 11:28). When we come to Jesus, He will also give us the power to live faithfully for Him.